With Christmas just around the corner, I've been on the lookout for gift ideas that will sneak a little extra creativity or learning into kids' lives. When you're thinking about Christmas gift ideas for kids, of course you can't go past books. To add value to this list, I've suggested add-ons for each book. Terry Denton's bumper book of holiday stuff to do! An activity book: Books don't always need to be about stories. What I love about Terry Denton's bumper book of holiday stuff to do! is that it will make kids' eyes light up AND it encourages them to be creative. It's a great choice for kids 7-12, but younger kids would also appreciate it with a little help from Mum or Dad. Packed full of hours of holiday fun, the Bumper Book is a must-have for every child! This fantastic activity book contains 300-pages of fun drawing activities, cartoons, maps, lists and games to entertain children, take on holidays or pass the time on long car trips. Terry Denton has an uncanny ability to tap into all the funny, crazy, yucky, weird and downright silly things that children love! Kids will lose themselves for hours in this interactive compilation of everything Terry does best. This is not just your average activity book. Denton has created a variety of pages. There are some where kids need to add to a drawing, others where they need to find an object, activities that involve a little writing, explanations and practise of drawing skills like perspective, invitations to create and be quirky, drawings to copy and then innovate on - basically, a ton of prompts for further creativity. Teachers will also love this book because it provides great ideas to start kids writing and creating. Kids will love it because it's FUN! At $16.99, and 300 pages, parents will find it's real value for money. It would be great paired with a set of colouring pencils. 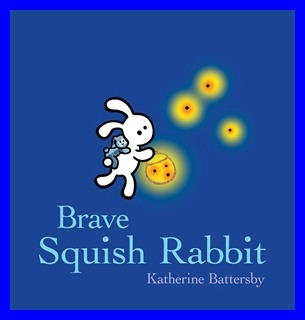 A picture book: If you're looking for a gentle, funny but meaningful picture book, I recommend Brave Squish Rabbit by Katherine Battersby. The first thing youngsters will love is the smooth padded cover to run their fingers over. It even glows in the dark! The deceptively simple drawings will make them giggle, and make them think. They'll relate to Squish's fears, because kids do know fear, especially fear of the dark. They'll admire Squish's resolution, and finally, rejoice with Squish at the end of the story. This is the perfect choice for under 6's, and would be great paired with a torch, or soft bunny toy. 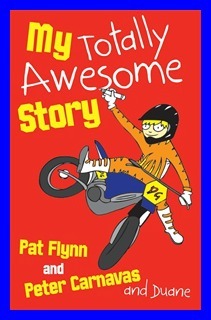 A chapter book: My Totally Awesome Story by Pat Flynn and Peter Carnavas is my chapter book choice because it will appeal to such a wide range of kids. Hero, Duane, is learning to write a narrative - or is he? Duane will have kids in stitches as he shares his take on school, life and everything in between. There are thousands of great chapter books out there for kids, but if you're not sure of a child's favourite authors or themes, I suggest trying this one. As if the humour and engaging writing style isn't enough, Flynn has added value to My Totally Awesome Story by compiling excellent notes for it. Teachers, take a look at this one for a lighthearted way to look at the craft of writing, too! 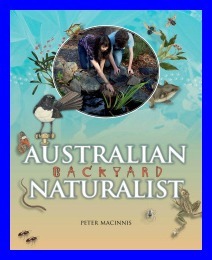 A non-fiction book: Australian Backyard Naturalist is quite simply a stunning book that the whole family will enjoy and learn from. Each time I dip into it, I lose myself in its fascinating facts, achievable projects and quirky humour. It was written by Peter Macinnis. He has my utmost admiration as a writer who brings non-fiction to life for kids. Read more about it in my review. Not a book at all: These next choices aren't books, but sure to sneak some literacy into Christmas just the same! 1. 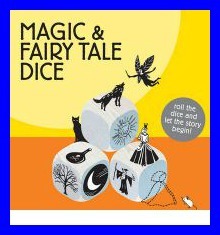 Book Depository, which has free delivery to Australia and many other countries, lists Magic Fairytale Dice, perfect for creating imaginative stories. Kids will want to record the stories they create with the story cubes, so you could pair them with a cute notebook. If your budget will run to it, buy the whole family a gift and choose a video camera so you can make home movies of the fairy tale creations. 2. 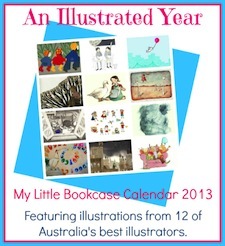 My Little Bookcase is offering a beautiful 2013 calendar, featuring 12 of Australia's finest children's book illustrators, for download. At the end of the year, why not frame the prints as art work for a child's room or library? It's such a great gift idea to pair a book with a "matching" toy or game. With this next group of books, some specific titles and some generic, I've gone a step further and added a website or internet tool that I think will add value to bookish gifts by providing a "matching" learning activity for kids to engage in. * Any book about bugs. You could pair the book you choose with a bug catcher, a magnifying glass or even a digital microscope (Yes please, Santa!) A great follow-up activity would be to visit Science Bug with your child. Explore the site together sometime when your young naturalist isn't busy searching for bugs. Or choose an activity from Scholastic's Going Buggy to do together. * Topsy-Turvy World by Kirsty Murray, a book about how Australian animals puzzled first explorers. Pair the book with a stuffed toy Australian animal. Follow up with a visit to the Australian Museum, or check out Wild Kids, the Australian Museum's excellent website for kids. * Any Magic School Bus book. Pair it with a toy bus to suit your child, and browse the activities Scholastic suggest at their Magic School Bus website. * Any Find-a-Word or word puzzle book. Pair it with some new pencils or markers, and play some online word games via the great Merriam-Webster website. * The Tale of Peter Rabbit. (Project Gutenberg download) Pair it with any rabbit soft toy, or the actual Beatrix Potter toys. Follow up with fun and games at the Peter Rabbit website. * Star Wars Origami, or any introductory book about origami. Pair it with some packs of origami paper, and explore Origami Fun or Origami Club (animated directions) together. * Any beautiful children's picture book with a matching soft toy. Pair it with a shared visit to Storybird. This is a magical site where kids can use stunning illustrations to create their own picture books. * Tough Boris by Mem Fox. Pair this with a Little Tikes Pirate Ship. Search for pirate illustrations at Storybird or read some books created there based on the pirate theme to get ideas for developing your own pirate story. If you're looking for reasonably priced but quality book gifts and you live in Australia, check out Australia Post. They have 4 Graeme Base hardcover books for $24.99. Big W has great pairings of toys and books. Look for Where is the Green Sheep, with its woolly green stuffed toy, Noni the Pony plus toy pony, Hairy Maclary with scruffy toy dog and Diary of a Wombat with a cute toy Mothball, all $16. I hope that gives you some ideas for Christmas. Take a look at Family Bookshelf right now for literacy and literature related gifts and tips. If you need more, check out the Motherlode of bookish gift ideas at MotherReader - 150 Ways to Give a Book. 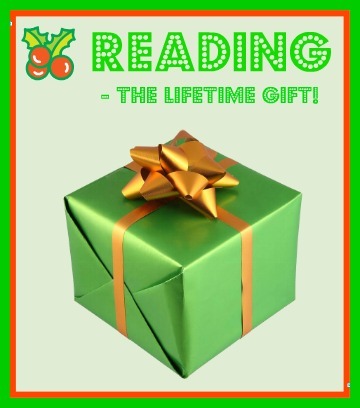 Remember, books make great gifts, and the gift of reading lasts a lifetime! Thanks for the recommendation. I'm not on royalties, but I think this is the book I would most like to be remembered by--after I hang up my pen and turn up my toes, which is not yet on the schedule. 'Australian Backyard Naturalist' was written for the kid I was (and still am) and for those who can be lured into the byways of science. @Peter Macinnis Lovely legacy! Kids will get such a lot out of your book. We just got Brave Squish Rabbit from the library. It is really wonderful. @JDaniel4's Mom I love books that help kids feel brave! Aw, I am going to put Brave Squish Rabbit on MY wish list. Glow in the dark? That rocks! Thanks for the shout out Susan! @Terry Doherty Literacy Lovers of the World, Unite! 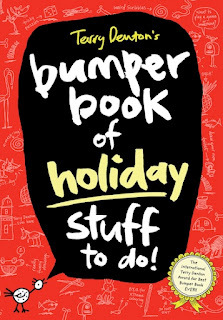 The Bumper Book of Holiday Stuff To Do would be a perfect gift for my kids for the holidays. We are going to visit my brother in the States and I'm sure there will be some downtime where they won't know what to do with themselves! Re. the fairy dice... We have something very similar called Story Cubes that have the same idea. We were doubled over laughing with tears streaming down our face playing with those. All of us (my hubby, myself, my daughter who is 9 and my son who is 6) LOVED playing with those. They are totally a great Xmas gift idea. @Renee C.I've seen mention of Story Cubes - in fact, I have a link to some dyi cubes in my storytelling ideas post http://www.thebookchook.com/2011/06/sixteen-sensational-storytelling-ideas.html I am fairly sure there is an app for iPad based on the idea, too. Hope your son enjoys the Bumper Book!